Over this Labor Day weekend and I cannot tell you how much this book moved me, changed me and brought out so many emotions. Amazing, simply an amazing book. I would recommend it to anyone whether they read or not, because once you begin you will be hooked. This book has been a part of me since I began reading and understanding just why this book has been so widely received. 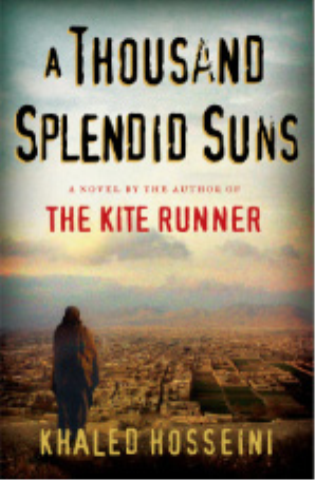 A Thousand Splendid Suns debuted as the #1 book in the nation, and it held the top position for 4 straight weeks. In addition to being #1 on The New York Times hardcover fiction list, it was also #1 on nearly every national bestseller list, including USA Today, The Wall Street Journal, The Washington Post, San Francisco Chronicle, Boston Globe, Chicago Tribune, Denver Post, Rocky Mountain News, Publishers Weekly, and Fort-Wayne Journal-Gazette. It was also #1 on the overall Book Sense list as well as #1 on regional Book Sense lists across the nation. As with his last book The Kite Runner which was also amazing, Khaled Hosseini is an amazing gifted writer! I finished A thousand splendid suns while camping in Mohican and couldn't help but feel like I was in Afghanistan as I read through the descriptive scenery of the book. So much to be learned through the world described by Hosseini throughout this book.